Johnny Adams was a Hall of Fame jockey whose career spanned the period 1935-1958. During that time, he had 20,159 mounts, including 3,270 winners. Adams was born in Carlisle, Arkansas, and moved with his family to Iola, Kansas as a small boy. He rode his first race in Uniontown, Kansas in 1929. By 1937, he was the nation's leading jockey--a feat he repeated in 1942 and 1943. Another career highlight came in 1954, when he won the Preakness with Hasty Road. In 1955, Adams became the fourth jockey to reach the 3,000 win mark. In 1961, he was a charter inductee in the Kansas Sports Hall of Fame. He was inducted into the National Racing Hall of Fame in 1965. Johnny Adams died in Arcadia, California in 1995. Johnny Adams was a Hall of Fame jockey whose career spanned the period 1935-1958. During that time, he had 20,159 mounts, including 3,270 winners. Adams was born in Carlisle, Arkansas, and moved with his family to Iola, Kansas as a small boy. He rode his first race in Uniontown, Kansas in 1929. By 1937, he was the nation's leading jockey--a feat he repeated in 1942 and 1943. Another career highlight came in 1954, when he won the Preakness with Hasty Road. 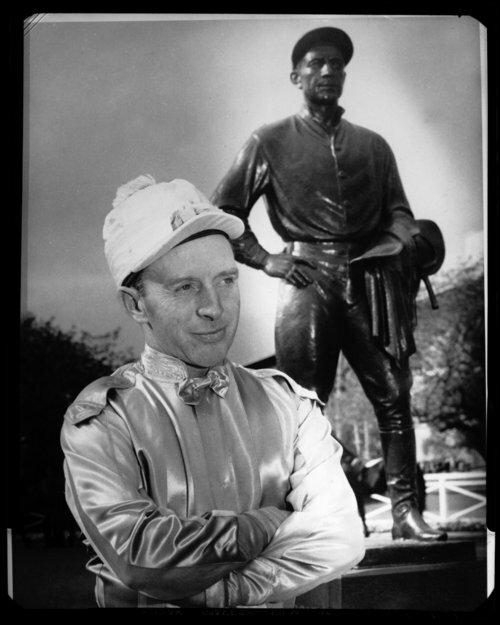 In 1955, Adams became the fourth jockey to reach the 3,000 win mark. In 1961, he was a charter inductee in the Kansas Sports Hall of Fame. He was inducted into the National Racing Hall of Fame in 1965. Johnny Adams died in Arcadia, California in 1995.